Half a century ago, sailing the Inside Passage from Seattle to Alaska wasn't as safe as it is today. 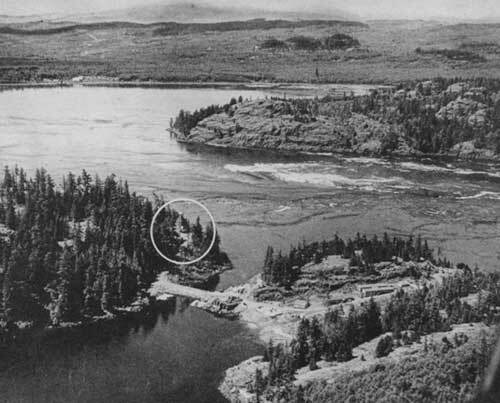 A pair of dangerous underwater peaks jointly called Ripple Rock created severe whirlpools in the waters near Vancouver Island, sinking numerous ships and claiming more than 100 lives. It took the largest non-nuclear explosion in history to finally end the threat. Seymour Narrows, the location of Ripple Rock, was a hazard to navigation from the time the first sailing ships began charting the area. Permission granted to SitNews by Campbell River Museum for publication. Campbell River Museum and a publication fee is required. In his diary of his 1792 voyage to Alaska, English Captain George Vancouver called the narrows one of vilest stretches of water in the world. Over the next two centuries, more than 20 large vessels and 100 smaller craft foundered over the tides rushing across the twin underwater peaks of Ripple Rock near the Vancouver Island community of Campbell River. Former Ketchikan resident Esther Foord Miller had a hair-raising experience when her family tried to negotiate the passage in 1910. She noted that without warning a large whirlpool began to spin the family's 20 foot boat in circles. We were really in trouble, Miller told the Tacoma News Tribune in 1975. Dad had hurt his hand, Mom had scalded her foot and a halibut fisherman who was with us hurt his back, I was the only healthy one. Miller - a nine year old in 1910 - said that she had to try to keep floating logs away from the boat in the maelstrom. Dad held me by the seat of my britches while I hung over the side and pushed the logs with a pole, Miller told the Tribune. Then boat began to sink lower into the whirlpool. Dad started yelling instructions. He told me to move some heavy gas cans from one side of the boat to the other. I don't know exactly what effect my work had, but we pulled free. In a website devoted to Vancouver Island history and events, Jeremy Leete writes that the first official victim of Ripple Rock was the side-wheel steamer USS Saranac in 1875. The ship approached the rocks at low tide and the coast pilot recommended waiting until high tide to traverse them but the ship captain overruled him. Joe Sadilek was a crewman on the ship and later offered his observations, according to Leete. ". . . when in the midst of a whirlpool, the ship refused to answer her helm and was for a moment beaten about by the angry water, when all of the sudden there came a crash that shook the ship as if it had been fired into a battery of guns. . . . The fearful rush of water as it closed over her was so powerful that it would have killed any living being who might have been aboard, Sadilek wrote. The steamer sank, but remarkably no lives were lost. Later vessels would not be so lucky and by 1958, more than 110 people had drowned on "Old Rip". Over the years, Canadian officials debated how best to deal with the problem. Finally in 1931 a Marine Commission's findings brought a recommendation to remove Ripple Rock, but it was 1942 before an attempt was finally authorized. Surprising enough, according to the website of the Campbell River Museum, removing the obstacles was not a universally accepted idea. Despite the extreme hazard the rock created, its removal was bitterly opposed by some, who saw it as a bridge support for a railroad connecting Vancouver Island to the mainland, the museum website noted in a 2001 story on Ripple Rock. 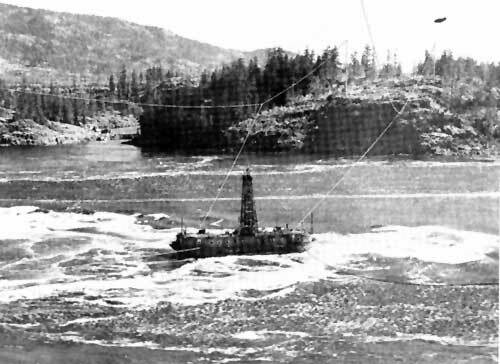 In 1943 a drilling barge was floated over the rock, held in place by one and half inch steel cables attached to 1000 tons worth of concrete anchors. The idea was drill holes in the rock, fill them with explosives and incrementally blast the rock with several small explosions. But the currents in the narrows played havoc with the 150-foot barge and the anchor lines broke over and over again. The attempt was abandoned. Two years later, a second attempt was made. This time the plan was to attach the barge to two 11-ton overhead steel lines on a 3,500 foot cable. But that failed to hold the barge in place for very long as well. It had been estimated that 1,500 drill holes were needed, but only 139 were drilled before that attempt was terminated. Nine workers died in the two attempts. A decade passed before the National Research Council came up with a plan to tunnel under the rocks from nearby Maud Island. It may take one of history's greatest underwater explosions to do the job, the Associated Press reported in November of 1955. The public works ministry estimated the cost might run to $2 million. Specifications for the removal project call for sinking a 500-foot vertical shaft at Maud Island, tunneling 2,100 feet under the narrows and running 300 foot shafts upwards into (each) rock. The AP noted that - if the blast was successful - the depth would be increased to 40 feet at low tide. The work began in November of 1955 and took nearly 27 months., according the Campbell River Museum. An average of 75 men lived at the base camp (on Quadra Island), the report on the museum website said. Three shifts of hard rock miners advanced six feet a day on the shaft sunk from Maud Island. When the digging was complete nearly 1,400 tons of Nitramex 2H explosives were put in the "coyote" tunnels inside the two pinnacles. "With 1,375 tons of explosives packed into the peaks, April 5, 1958 was the date set for detonation," Leete wrote. On that day, at 9:31 a.m., Dr. Victor Dolmage, consulting engineer for the Ministry of Public Works, pushed the plunger that set off the largest non-nuclear explosion ever. 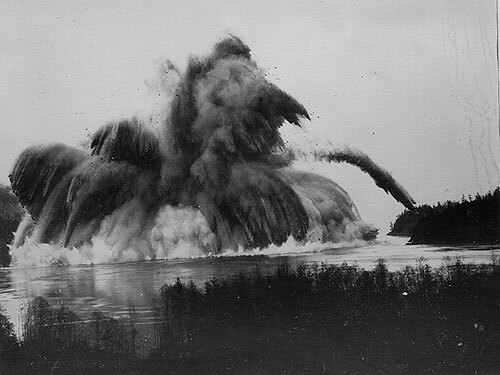 The blast pulverized 370,000 tons of rock and displaced 320,000 tons of water. Rock and debris rocketed 1,000 feet into the air. The explosion also created a 25-foot tidal wave which quickly dissipated and caused no damage. There was also little apparent damage to area sea life, according to Leete. Norman Hacking, Vancouver Province marine editor during that time, witnessed the explosion and wrote, "We saw a few bug-eyed snapper but that was all." And in fact, there was a very small number of fish casualties, Leete wrote. Planners intentionally scheduled the explosion for April when there were few salmon in the area. 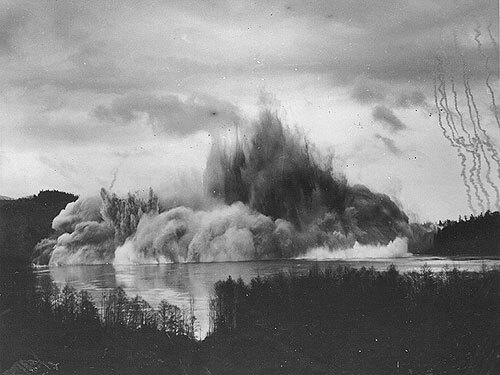 There were no documented cases of any dead salmon or herring from the Ripple Rock explosion. The Campbell River Museum website concurred. No damage was sustained, the website reported. Careful monitoring by the Fisheries Department found that five orca, a school of porpoises, two sea lions and one fur seal seen near the area before the explosion were all seen again afterward, although understandably somewhat perturbed. The explosion was more than a local spectacle. The event was broadcast live across the country and in the US and has been broadcast numerous time since then. For Campbell River, the explosion was somewhat anti-climactic. The Royal Canadian Mounted Police had evacuated everyone within a three mile radius of the site. Leete says that many residents were anxious about earthquakes and flying boulders. "I was assistant manager of Painter's Lodge at the time," Campbell River resident Les MacDonald told Leete. "We had engineers staying with us. . . telling us about this massive explosion that was coming, telling us that it might trigger an earthquake. The insurance company made us take everything off the walls - everything; we had to put everything on the floor. We really had no idea what was going to happen when the blast went off. Nothing. That's what happened. We didn't hear or feel a thing." Like the rest of the country, most Campbell River residents watched the explosion on television. Cushioned by the water, the sound was heard only near the explosion and the tidal wave dissipated without causing damage. The Associated Press reported that the only official damage was to a wall clock at the mining camp on Quadra Island. With the top of the rock sheered off, the south pinnacle's depth was increased from 9 feet to 45 feet at low tide and the north pinnacle's depth was increased to 70 feet. But - as Leete found when he tried to navigate the narrows in a 15 foot boat a few years after the blast - Ripple Rock wasn't completely tamed. "Without warning, the idle water beneath us changed to a fast-moving torrent. The tidal flow began bullying the boat as we approached Seymour Narrows," Leete wrote. "The continuous pitch of the outboard was now being interrupted as the propeller cavitated in the frequent air pockets created by the strong current. Sideways, up and down, in random chaos, the ocean river played with us much like a kitten with a string."